Are water ionizers easy to maintain? What are the ongoing maintenance costs of owning a water ionizer? How much time will I spend keeping my water ionizer working properly? 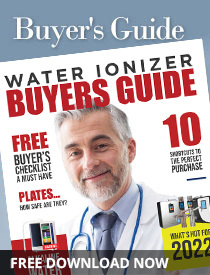 In this article, you’ll learn about the basic maintenance required to ensure your water ionizer continues to produce good quality ionized alkaline hydrogen water for years to come. Maintaining your water ionizer shouldn’t be much of an imposition on your time, even in the busiest of households. It will ensure the quality of the water you are drinking and the long-term performance and look of your water ionizer. Depending on the water ionizer machine you choose, how much you use it and any prefiltration options, you’ll need to replace the filters inside your water ionizer once every 6 to 12 months. Every water ionizer will have some sort of filter life indicator letting you know when it’s time to replace the filters. More advanced models will give you a warning several liters early letting you know water ionizer filter change time is right around the corner – giving you time to order replacements if you don’t already keep them on hand. Replacing the filters is typically fast and easy. With most water ionizers you can replace the internal filters in less than 5 minutes. Filter change only involves accessing the filter area on the front or back of the unit, removing the old filters, putting in the new ones and then resetting the filter life on the unit. You’ll always want to flush the new filters for 2 to 5 minutes to saturate the media inside giving fine carbon and other filter media particles time to bond. Most water ionizers now have cleaning cartridges available to remove scale buildup that will occur inside the electrolysis chamber and, if you’re in a hard water area, inside the dispenser hose, regardless of your water ionizer’s automated cleaning cycle. The number of times a cleaning cartridge is recommended for use will vary from company to company. One company wants you to use a cleaning cartridge every two to four weeks. Most recommend once every 12 to 18 months or as often as once every 6 months in hard water areas. The amount of time you spend performing cleaning will also vary based on the company’s cleaning cartridge or recommended cleaning protocol. The easiest being one-time-use cleaning cartridges which are used once every 6, 12 or 18 months – depending on your source water. The more time-consuming cleaning procedures use small reusable cartridges or involve a cleaning “protocol” that you perform using items available for purchase at a local store. With one-time-use cartridges, you’ll replace an internal filter with the cleaning cartridge and allow the unit to run at the neutral setting for 20 to 30 minutes. This circulates the cleaning crystals inside the cartridge which remove scale from the electrodes and inside the dispenser hose. Install the cleaning cartridge, turn the unit on and check back in 20 minutes. These cartridges can also be used for “deep cleaning” by letting the cartridge run for 5 minutes, then shutting the unit off allowing the electrodes to “soak” in the cleaning solution for up to an hour. Other companies have customers use a fish pump to circulate vinegar through the unit for an hour or more. Some have a protocol that requires dissolving citric acid crystals in distilled water to circulate in the unit and then soak for an hour or more – then repeat. Reusable cartridges are similar to the deep-cleaning method used with one-time-use cartridges – inserting the cartridge with fresh cleaning powder, running the unit for a few minutes and then allowing the unit to soak for up to several hours. They also require repeating this cleaning every four weeks. 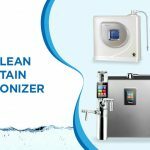 The amount of time you’ll spend keeping your water ionizer’s electrolysis chamber free of scale buildup will depend on the water ionizer model you choose and that company’s recommended method of cleaning. You can do this as part of your regular house/kitchen cleaning routine. Using a soft damp sponge or cloth, just wipe down the unit. That’s it. Avoid using cleaners – these can damage the finish of the unit or the display panel and depending on the control panel, over time these cleaners can eat away at the labeling on the control panel – Think of a well-used keyboard and how the letters on the most-used keys begin to fade over time. Only use a “damp” cloth or sponge – excess water can seep into the unit where it shouldn’t be. Only use a soft cloth or sponge to avoid scratching the finish or rubbing away any of the indicators printed on the control panel. By maintaining the internal filters you will ensure the quality of the water being ionized. Performing recommended cleaning will maintain the performance of the ionization chamber for quality alkaline and acidic water – and will prevent blockages from excess scale buildup inside the unit. Wiping away dust, spills, and splashes from the front of your water ionizer will make sure it looks just as good as it performs for a very long time.